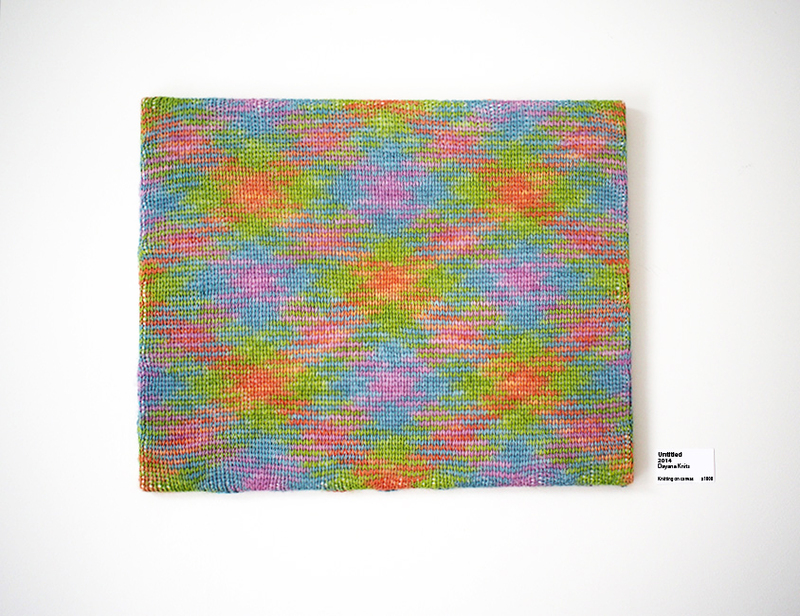 I have recently been fascinated by knits that use "dropped" stitches to make all sorts of motifs. Dropped stitches are interesting little creatures. You knit like normal but right at the very end you drop the stitch off the needle and let it run like a bad pantyhose down to the bottom. 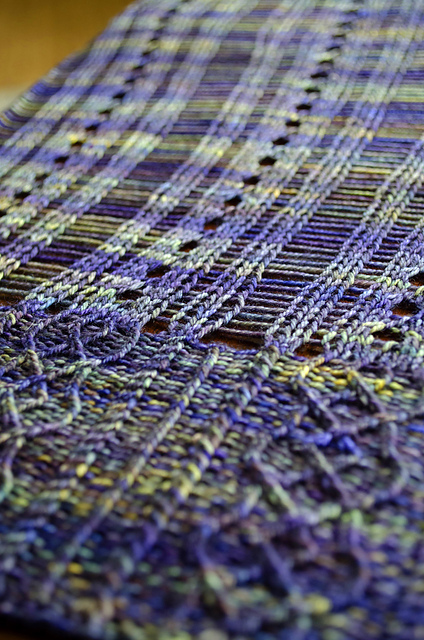 The most famous use of drop stitiches is in Kate Gilbert's Clapotis, which has to date 21,251 projects on Ravelry alone. No pattern (Anthropologie), can someone make one, pretty please? 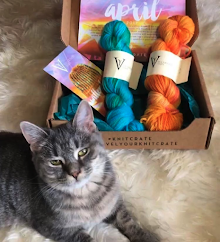 I was delighted when Sheila Toy Stromberg put her Catskills Cardi up in the test knitting group I mod on Rav... look at those drops! This is not a full cardigan, the fronts are vestigial really, and meant to hang just below the underarms. In my mind's eye, it was going to be the perfect cover up for a little black dress. Agreed? The yarn is gorgeous and filled with the kind of gold bling I need in my life. BUT IT CONTAINS MOHAIR. If you choose mohair content in your yarn for any drop stitch motif, you will spend many hours getting those stitches to drop down. They will stick and need to be torn, pulled or at last resort, snipped. 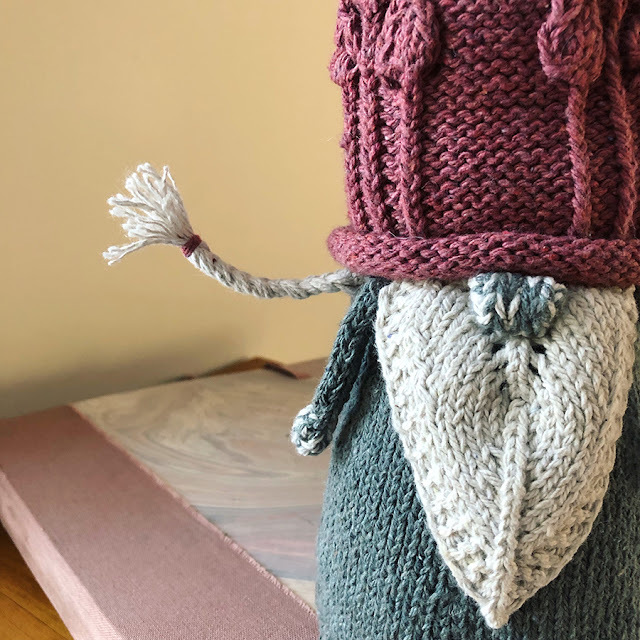 Because the drop stitches aren't created until the very end and add a lot of ease once dropped, the pattern will make you a miniature sweater. There is no way that the size you choose will fit until you start dropping those stitches, so don't despair when it looks too small! It is helpful to use blocking wires to really stretch it out. See my blog post on blocking this cardi. I changed this cabled motif from the original pattern. You are supposed to repeat the motif the stated number of times, but I thought it would be nice to close the cable to a point. If you would like instructions on how to do this, just message me. 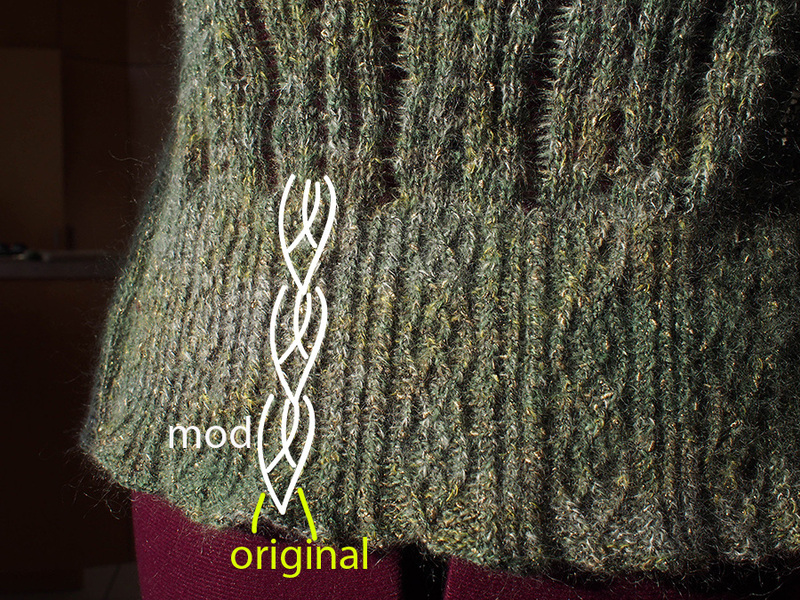 This pattern has a lot of nice little finishing details for the ribbed edge of the sleeve and neckline, which are knitted into the motif so that there is *virtually no sewing needed*. The only time you sew is a 6-st kitchener and a little bit of tacking down. Great! 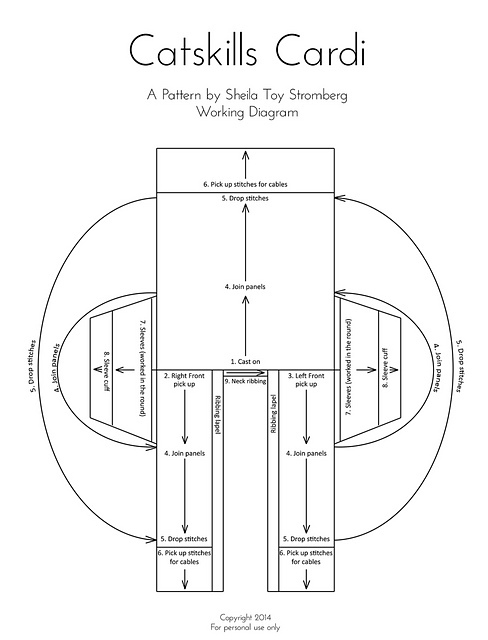 However, this is definitely an advanced intermediate pattern, and I recommend that you read her "timeline schematic" to understand how the piece is constructed before you begin. No, I didn't shoot some of these photos on a vacation to some fabulous Mediterranean oasis. Sadly, these shots were in the dead of a winter, in a ski town no less! We spent a weekend in Sutton, Quebec and stayed in a mansion that has an indoor pool in a room that is always heated to 30 degrees C: Le Domain Tomali-Maniatyn. Along with some cross-country skiing, we also visited one of my *new* favorite LYS's for the first time, Mont Tricot! What a great name for a yarn store in a ski town, right? The owner Lucinda is a blast, and she carries fabulous yarns. 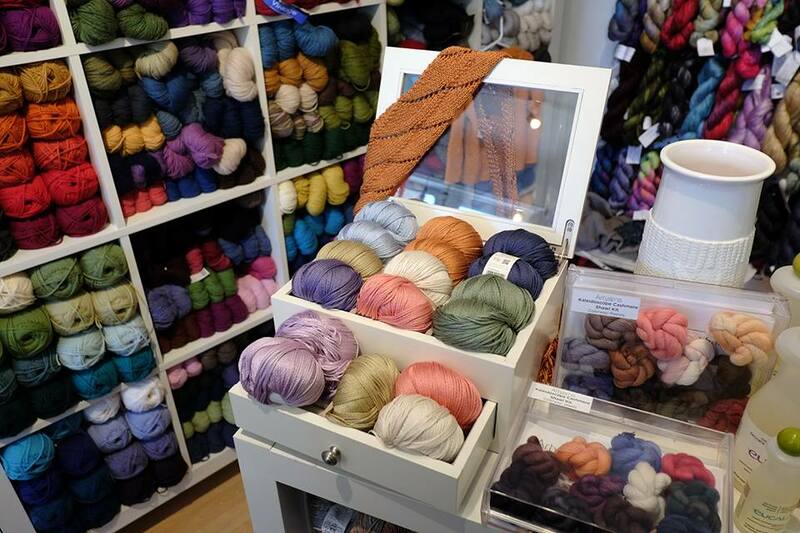 Here is her display of the new Rowan Truesilk (100% mulberry silk), spilling luxuriously out of a jewelry box. 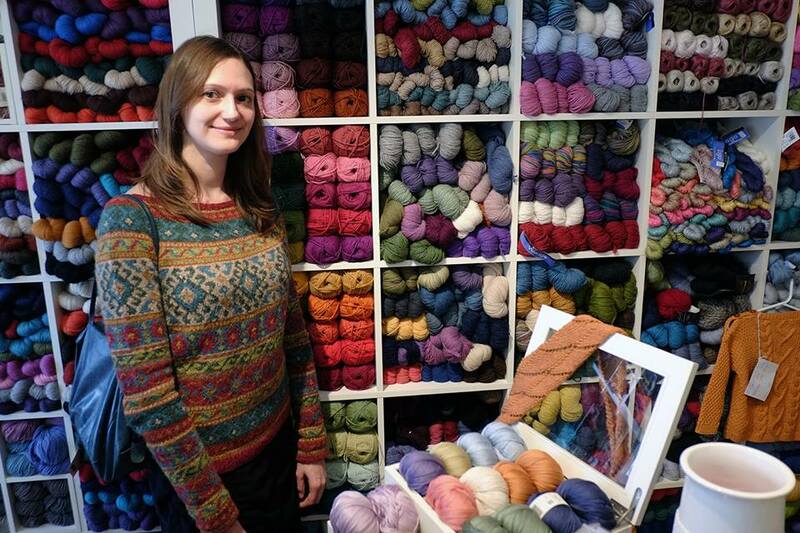 I couldn't resist posing in front of her rows of Pure Wool Worsted either. 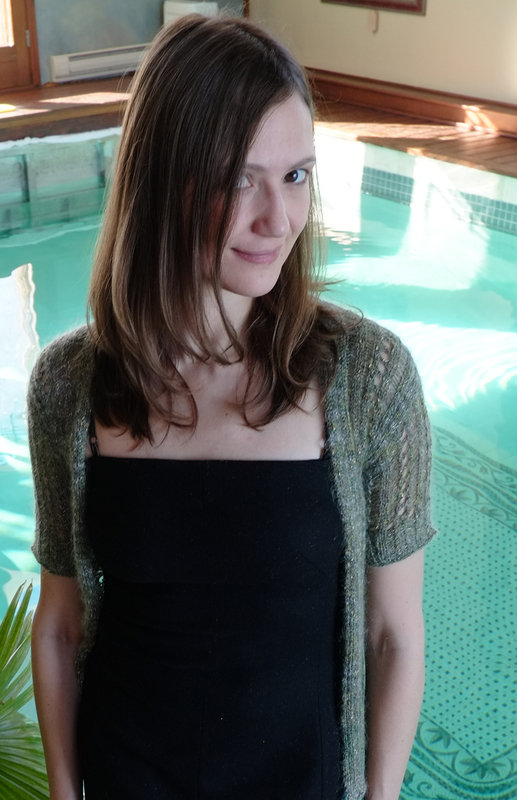 Want to read about the sweater I am wearing? Click here. If you are ever nearby (she is close to the US border, too! ), do visit. In honor of our wonderful visit to Sutton and it being closer than the Catskills of my home state New York, I've re-named my cardigan to the mountain range nearby! This is a fabulbous sweater! Dropped stitches with mohair.....you are amazing....do not attempt this readers :) a little bit of warmth goes a long way, doesn't it! You are so right to warn them, lol! I had to keep my trust embroidery scissors in hand. Oh, I love your cardi, love the other dropped-stitch designs you've featured, love that Lang yarn your belle-mere gave you. . . and of course, I love that beautiful pool! 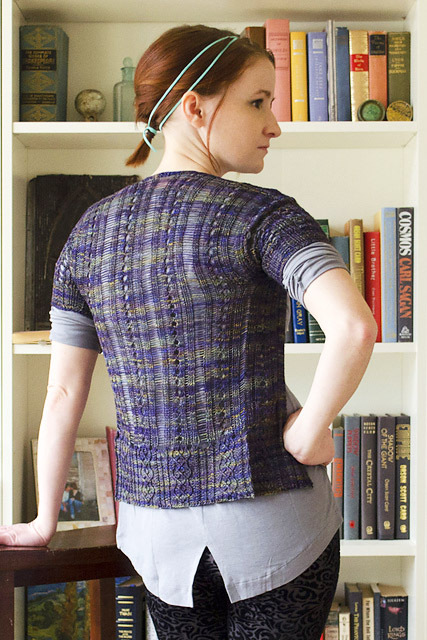 Another dropped-stitch pattern I like is Amy King's "Drop Stitch Cardigan" (good name, eh?) from the Fall 2005 issue of Interweave Knits. My rendition is the "cobwebs cardigan" on my Rav project page. Oh, mustn't forget to say that I love your LBD too. Thank you for all the love! That LBD is a keeper, as long as I can jam myself into it, lol. All those little specks are actually gold, I so love that dress. 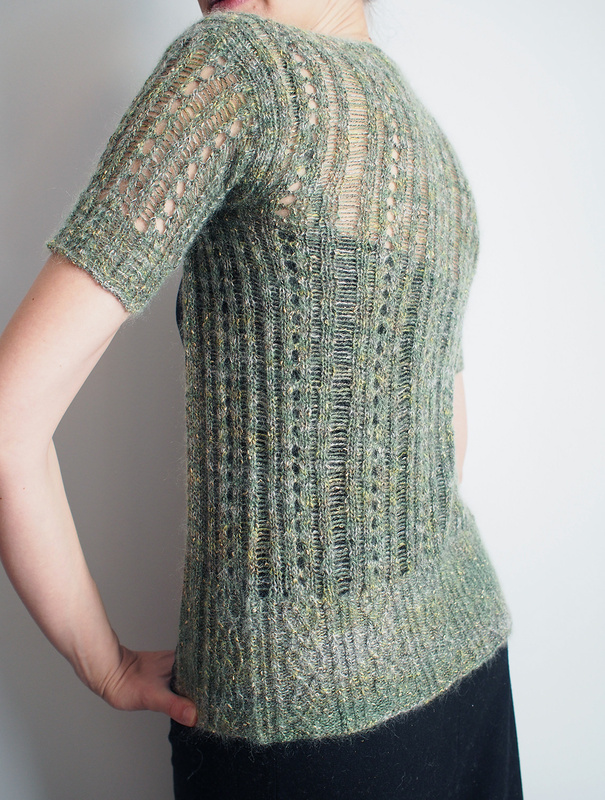 Yes, I remember the Drop Stitch Cardigan now, thanks for pointing me to it! 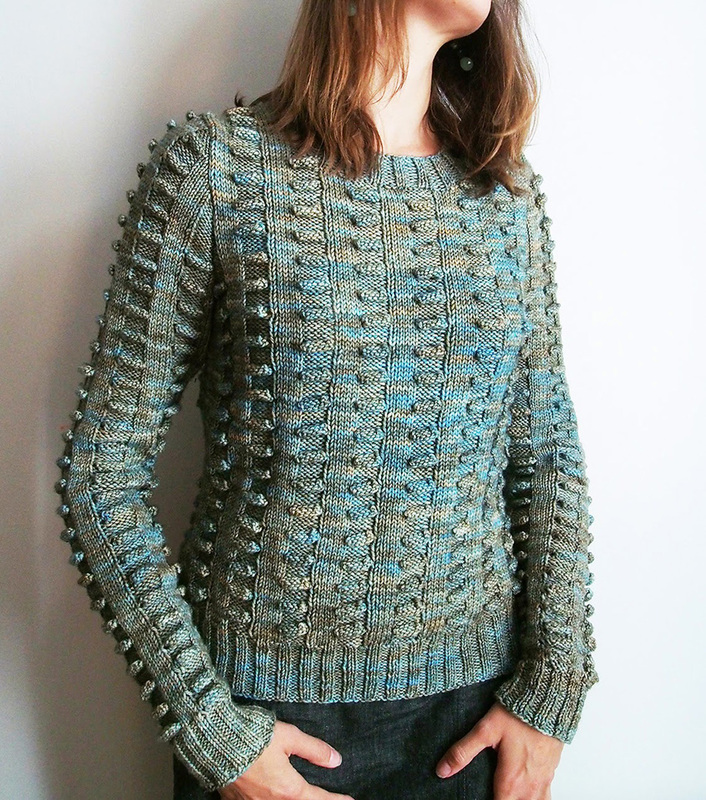 How brilliant, using drop stitches to look like ribbing. Thank you! 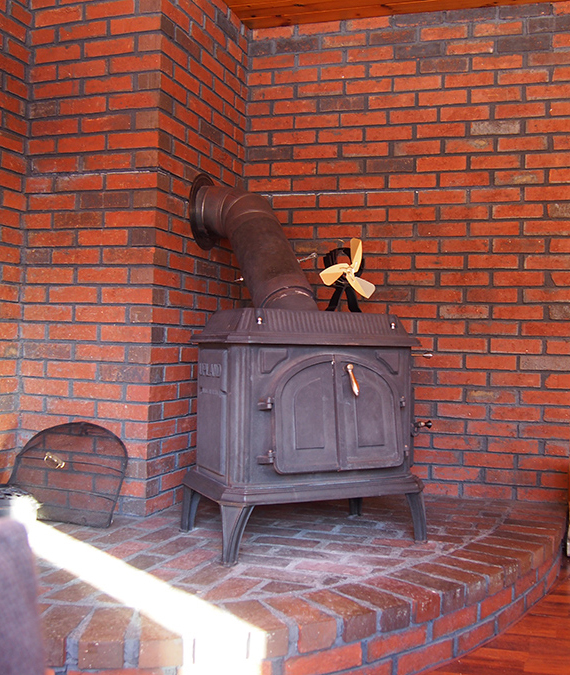 The cabled edging just brings it all together and gives it structure... inspired, indeed! I wish Mont Tricot was next door, sigh. I suppose anonymity is a virtue, then! This looks fabulous Dayana....perfect for your LBD! Thank you! This is a new acronym I learned today from Stashdragon (above), love it. I love yours so much, I already bought the pattern. I remember when she posted the test knit, I was so busy I couldn't sign up for it. I will make myself one. That is a gorgeous cardi, and looks fantastic on you! I'm thinking of getting the pattern myself. Thank you! I'm not very good at remembering to wear short-sleeve cardis, but I'm hoping that this is pretty enough to grab off the shelf often. It's a beautiful cardi, Dayana. 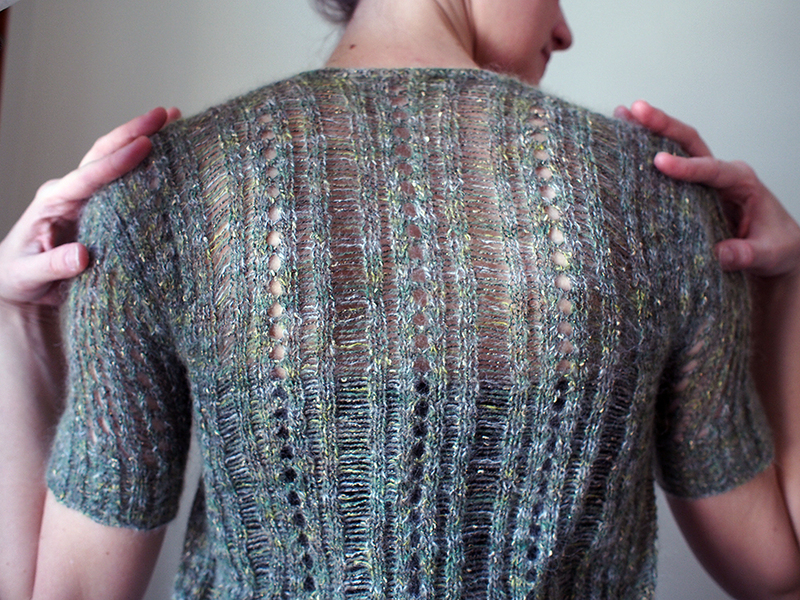 And any knit blogger who can work the word "vestigial" into a post has my utmost respect! Woo! Vestigial is a favorite word of mine. Actually, being a scientist, there is a "famous" fruit fly gene called vg (vestigial) because flies born mutant for the gene have the teeniest wings that don't work. This cardigan is pretty close, lol! Loving your cardi - and your lbs - they really suit you ! You are so clever ! 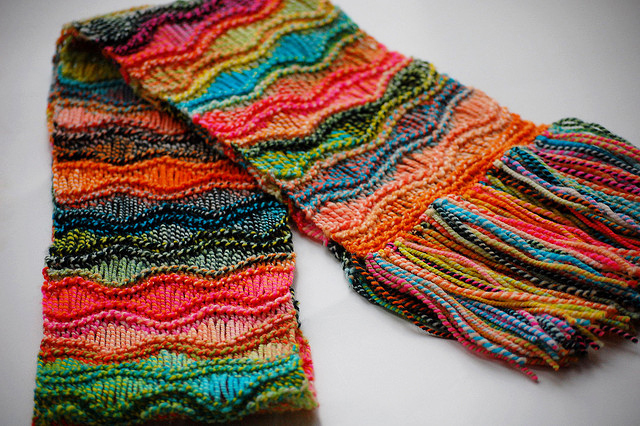 I love these examples of dropped stitches, especially the Shibui knits, which is fabulous!! 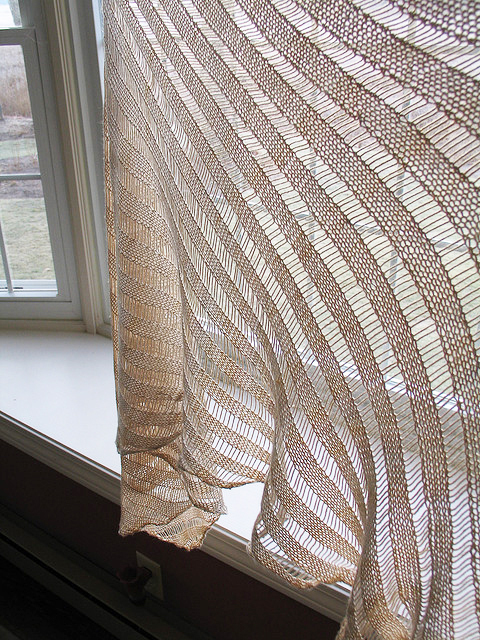 Catskills is very lovely and delicate and suits you beautifully. Love the hints of gold in it, too! 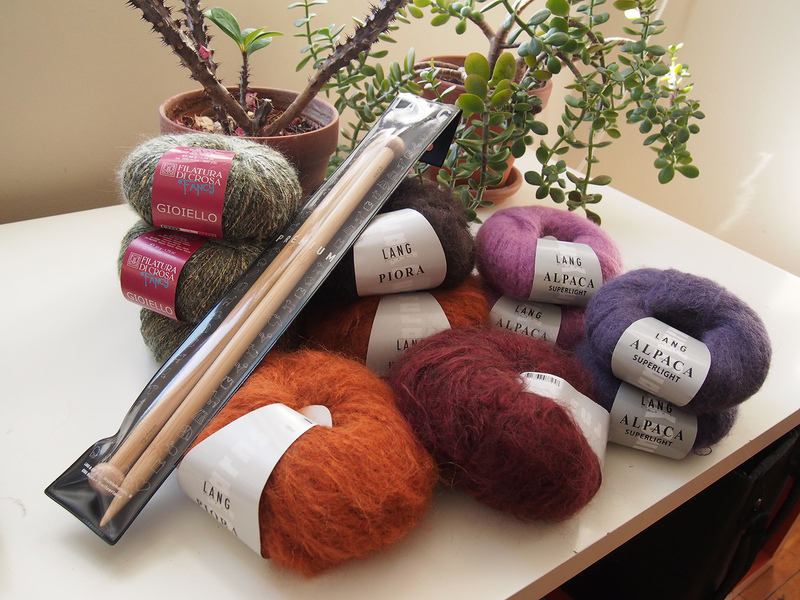 What fun, to receive a yarn care package from Switzerland! Now that you have all this Lang yarn, do you have a Fatto a Mano pattern to match? So cute, you in that lbd and the sweater. I am also a big of dropped stitches...the way they look and the way they go so fast!